BikeSkirt » Blog Archive » Auntie Em! 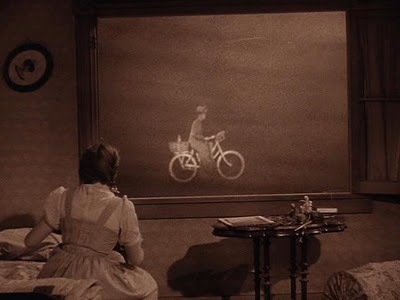 How did I forget that a bike was a big part of the Wizard of Oz?! The Wicked Witch may be been awful (or misunderstood if you are a Wicked fan), but she sure knew what sort of bike to ride. With Toto in that front basket and all! The wind tonight was insane! I was all over the road and finally had to walk it after a big gust threw me as I was wobbling up a hill. Too bad it was coming from the side and not from behind…that would have been a very welcome wind. Looks like a storm is blowing in. Yikes. Toto was in the back basket. The movie was made when many rode a bike not just evil witches.